Detroit circa 1903. 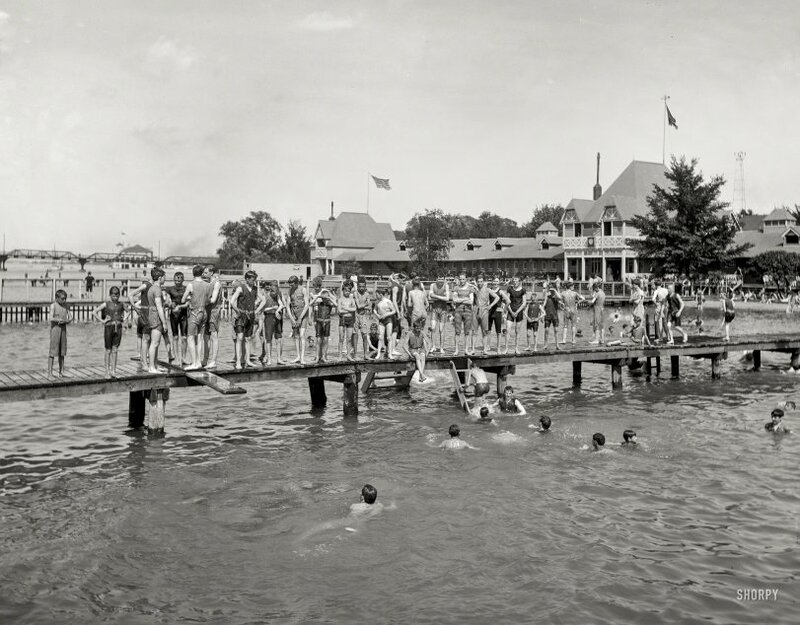 "Swimming pool at Belle Isle Park." 8x10 inch dry plate glass negative, Detroit Publishing Company. View full size. Submitted by WMtraveler on Wed, 07/26/2017 - 10:19am. The "Swimming pool..." refered to is actually the Detroit River, an American Heritage River. Submitted by EastsideAl on Wed, 07/26/2017 - 8:56am. This is a picture of the original Belle Isle bath house and beach, which was on the western part of the island, west of the bridge and adjacent to the original ferry landing. In 1909 the beach was moved to the center part of the island, where it would have less exposure to the Detroit River's strong currents. A new bath house (which Shorpy has shown in previously posted photos of Belle Isle) was built well to the east of the Boat Club building shown in the background here. That "new" bath house is now long gone too, but the beach remains, and is still open to the public for swimming during the summer months. Submitted by Vintagetvs on Tue, 07/25/2017 - 7:42pm. I'm telling you guys, Stripes are what's in for 1903, Solids are so 19th century. Submitted by bigguy1960 on Tue, 07/25/2017 - 3:00pm. The bridge in the background is the original iron-and-wood Belle Isle Bridge which burned and was destroyed in 1915, and was replaced by the current bridge in 1923 (originally named the George Washington Bridge, it was renamed the MacArthur Bridge in 1942). Beyond the bridge appears to be the Detroit Boat Club (a rowing club). Their clubhouse, the first concrete building in the United States, was erected in 1902 to replace wooden clubhouses which burned in 1893 and 1901.